Chad Kafka works as a district Technology Integration Specialist (Tech Coach) for Franklin Public Schools. 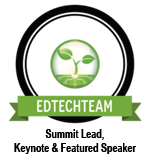 He enjoys the role of Technology Coach as it allows him to collaborate with teachers in his buildings and to team teach using technology with the students. Personally, Chad enjoys finding new ways to engage students using the technology at our disposal. Outside of Franklin, Chad enjoys presenting and networking with educators at the state and national level. Chad has presented at ISTE, CUE, WEMTA, SLATE, and Google Education Summits including the Midwest Google Summit and the Great Plains Google Summit. In the past, Chad has presented at four and co-chaired two of the annual Milwaukee Digital Media Conference events. 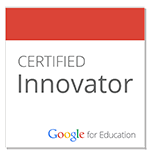 After applying and being accepted, Chad attended the Google Teacher Academy in Washington DC in 2009 and continues to network with many Google Certified Teachers across the world. See what we're talking about on Twitter or Google+ with the #GoogleCT hashtag. 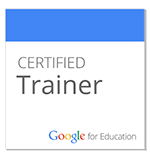 Chad completed the self-paced Google education training and passed the Google Qualification exams to become a Google Certified Trainer in the Fall of 2012. You can read some of the testimonials/reviews from his trainings/workshops/presentations at his Trainer marketplace page. Digital Differentiation with Screencasting (Fall 2011) - learn how to differentiate your students' learning by creating screencasts. Tutorials & Resources. Map Your PD Pathway (Fall 2012) - iTunes U self-paced course to explore different models of PD that tech trainers can offer. Resources. Chad personally enjoys learning new ways to be more efficient, effective and engaging with technology and hopes he's able to inspire and share some new things with you. You can find more information about Chad online at his website or network with him through Twitter (@chadkafka) or Google+ (chadkafka).